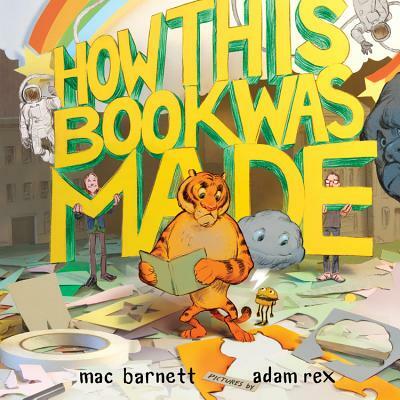 You may think you know how this book was made, but you don't. Sure, the author wrote many drafts, and the illustrator took a long time creating the art, but then what? How'd it get into your hands? Well, open the cover and read through these pages to find out. Just beware of the pirates and angry tiger. Mac Barnett is the New York Times best-selling author of over twenty books for children, including Count the Monkeys, illustrated by Kevin Cornell; Chloe and the Lion, illustrated by Adam Rex; and Extra Yarn and Sam & Dave Dig a Hole, both illustrated by Jon Klassen, and both winners of a Caldecott Honor and the E.B. White Read Aloud Award. He also writes the Terrible Two series with Jory John. Mac lives in Berkeley, California. Visit him at macbarnett.com. Adam Rex is the New York Times best-selling author and illustrator of Frankenstein Makes a Sandwich. His other books include The True Meaning of Smekday, which was made into the animated hit movie Home; Moonday; Fat Vampire; and Cold Cereal. He also illustrated the Brixton Brothers series, Billy Twitters and his Blue Whale Problem, and Chloe and the Lion, all by Mac Barnett, and Chu's Day by Neil Gaiman. He lives in Tucson, Arizona. Visit him at adamrex.com or follow him on Twitter @MrAdamRex.